Indra. God of War. War is intolerance. Make love not war!! Hinduism consists of many different groups who worship different dieties. In former times dominated the god of war and intolerance Indra. In the 6th Century BC, developed in India the yoga movement. It taught tolerance, peace and universal love. The Neo-Hinduism is based on Ramakrishna and represents the unity of all religions. It is a way of toleration and love. All religions can be paths to God, when practiced correctly. Ramakrishnas disciple Vivekananda was a famous member of the first World Parliament of Religions in 1893 in Chicago. Patanjali is the father of Indian yoga. He lived in the second century BC. In the Yoga Sutra, he grasped the essence of all yoga knowledge together in a few words. The two main sets of Patanjali are, "Yoga is the calming of the mind. Then the yogi lives in the light." The way of peace by Patanjali is to calm the mind over the years on the spiritual path more and more, and finally to be able to live in peace. To soothe the thoughts Patanjali recommends a two-step way. The first stage is the development of positive ethic qualities (the ten yoga principles). The second stage of the yogic path is to practice meditation. 1. Non-violence (ahimsa) = No killing other beings. Be meek. Be peaceful. Be tolerant. 2. Truthfulness (Satya) = Live in the truth. Basically, be honest with yourself and others. A Yogi is silent in doubt . Those who consistently lives in the truth radiate truth. Their fellow men trust them. 3. Righteousness (Asteya) = Not stealing, not cheating. A Yogi is in professional life generally honest. He does not seek unwarranted advantage, but he is looking for fair trade. 4. Wisdom (Brahmacharia) = Live in the spiritual focus (in the light/in God = Brahman). Do not serve the money (outer pleasure) but the inner happiness (enlightenment). Be centered in your inner happiness and peace. 5. Simplicity (Aparigraha) = Be moderate in external enjoyment and consumption. A spiritual person lives modestly outwardly and inwardly rich. A Yogi uses his energy not in outer actions, but lives so peaceful that it turns inward and cleanse his body from the inside. One day, he lives permanently in the light (the cosmos energy). 6. Worship of the spiritual goal (Ishvara-Pranidhana) = Thus we do not lose our spiritual path, it is necessary that we remind ourselves again and again to our spiritual goal. We can worship an image (Goddess, Shiva), we can bow before a statue or speak a mantra (prayer). Send light to all beings, and wish a happy world. 7. Sacrifice the ego (Shaucha) = The way into the light passes through the crucifixion of the ego. Without a crucifixion there is no enlightenment. True sacrifice is an art. He who sacrifices too much braced themselves internally. Who sacrifices too little, does not solves his tentions. How do you get inner peace today? "I let go of my false desires. I take things as they are." 8. Selfdiscipline (Tapas) = A clear goal, a clear life plan and a clear way of practicing. Tapas means to lead a disciplined life. Follow your inner wisdom and you'll win on your spiritual path. 9. Reading (Svadhyaya) = The daily reading (mantra, meditation) keeps us on the spiritual path, cleanses our spirit, connects us with the enlightened masters and makes us to spiritual victors. 10. Contentment (Santosha) = Satisfied with what one has. Get into the satisfaction with yourself and your life? "My thought of satisfaction is now ..."
Brahma (person) in Brahman (cosmos). God in Hinduism is called "Brahman". Brahman is the universe, the father and mother of all beings. Brahman is the highest dimension in the cosmos. Brahman is around and within all beings. To live in Brahman means to live in the light. Brahman can be realized through sat-chit-ananda, a life in peace (existence), unity and love to all beings. The many Gods and Goddess in Hinduism are role models to awaken the enlightenment energy. The most important Gods are Vishnu (the god of love) and Shiva (the god of yoga). Brahma is the god who represents the cosmic consciousness. With his four heads he visualizes the whole universe (all four directions together). Thus he becomes one with Brahman (cosmic consciousness). Shiva gets his energy from the Goddess and than gives it to his people. Bhagiratha was an Indian king. All his brothers and sisters lived in the hell. They lived in the world of suffering. They were inwardly unhappy. They were tormented by the seven demons anger, pride, envy, greed, fear, addiction and unwisdom. Bhagiratha knew that his brothers and sisters could not recover by themselves from their spiritual unwisdom. The path of inner happiness is hard to understand. The consistent spiritual practice is difficult to learn. And still more difficult it is the way of effective practicing to be found. Most people lose themselves in the formal practice and do not come forward. Without an enlightened master is not easy for a normal man to come into the light successfully. Bhagiratha decided to save his brothers and sisters from the hell. He became a yogi and brought first himself into the light. After having practiced twelve years intense yoga meditation, one night Lord Shiva appeared in his dream and asked him what he wants. Bhagiratha replied: "I want to free my brothers and sisters from hell. I want to bring all people of the world into the light of God. I wish a happy world full of happy people. " Shiva then opened the sky and let the water of life flowing down on the earth. The impact on the earth was so great that Shiva had to soften it. He let the water run through his matted Yogihaar, and it was spread on the ground in many small streams. The streams splashing from the Himalaya mountains into the Indian plains and irrigated the land. All India began to flourish, the people were happy and the animals were happy too. The result was the sacred river Ganges, which supplies today northern India with water. Bhagiratha transformed into Shiva. The water is the cosmic energy (kundalini-energy). The energy flowed inside and outside over his head and his hairs down on his body. After some time Bhagiratha was quite full of energy and happiness, surrounded by a cloud of light. Where he stepped his feet, the earth started to bloom. Red roses and white lilies lined his path. Near him the wild animals were tame, and the birds began to sing. When he looked like a God (Buddha/Shiva), beaming with happiness, he went back into the world of suffering (in yoga the material world can be called "hell") and told his people from the way of inner happiness. As he himself had achieved this, they believed him and followed him. All his brothers and sisters practiced every day the spiritual path. They practiced yoga, meditation and positiv thinking. They went the way of the consistently positive relationships. They lived their relations not from the ego, but from God (the light inside). Thus, the Paradise was brought to earth. The story of Bhagiratha is the connecting link between yoga, buddhism and christianity. It is the way of love to enlightenment (holiness, living in the light, in bliss). The essence of this three religions is to be happy and to be good. Love yourself (God within you) and realize your inner happiness. Love all beings of the world and realize a cosmic consciousness. Be a spiritual father and mother of all unenlightened beings. Help them on their spiritual way and built up a happy world. This ist the way to enlightenment, inner healing and holiness. Practice selfrealisation and universal love in balance. Give yourself the relaxation, rest and joy you need. Don´t think only of yourself. Concern for your fellow beings. Only we all together can built up a happy world. We are one family und have to help each other. That is the essence from the story of Bhagiratha. Shiva is the supreme God in Yoga. We can see him as the symbol of a victorious yogi. Shiva has a cosmic consciousness. He lives above the world of duality. He lives in the light (sat-chit-ananda, peace-unity-bliss). Shiva as cosmic consciousness can occur in many forms. The most famous incarnations of Shiva are the meditator, the blessing (the karma yogi), the ego sacrificer (subordinated under the goddess Kali) and the dancer with the life (Nataraja). Shiva is the master of life. He lives his life with the five features of love (earth), joy (air), wisdom (water), strength (fire) and resting (space, cosmos). He lives at the right moment the right property. 1. The Winner = We shake the fists near our head and think: "I am a winner. I reach my goal. ... My goal is...."
2. The Strong = We rub the feet on the ground and visualize the Mount Meru among us, "I'm sitting on the Mount Meru (Himalaya Mountains). I maintain equanimity in pain. I'm going with perseverance my way." 3. The Egoless = We make large circles with our hands around us, visualize the cosmos full of stars and think, "I live in the great system of the cosmos (nature). I take things the way they are." 4. The Hatha-Yogi = We visualize within ourselves the Kundalini Serpent, twist in the spine, move our toes and think: "I am a Hatha Yogi. I save myself with my spiritual exercises." 5. The Karma-Yogi = Shiva means "The Good". He works for the goal of a happy world. We move our hand, send all beings light and think, "I send light to... May all beings be happy. May the world be happy." 6. Master Yoga = We rub the palms before our heart chakra, visualize the sky above us and think, "Om all enlightened Masters. Om inner widom. Please guide and help on my way." 7. Shiva Picture = Concentrate on a picture or a statue of Shiva. Move one hand and take the energy from Shiva. 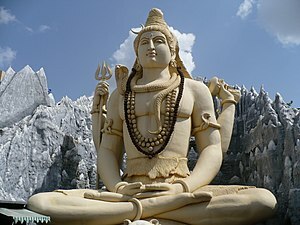 Think several times the mantra "Om Namah Shivaya" (I connect myself with Shiva) or "Shivo Ham" (I am Shiva) and feel how the energy of Shiva flows with the mantra in you. 8. Meditation = We put our hands in the lap, move your toes and think one minute the mantra "Om Shanti" (inner peace) in the belly. Then we stop a minute every thought. We spend some time relaxing in meditation and then come back. We are Shiva. We are a positiv dancer with the live. We go wise and optimistic our way. Archive on Hinduism and Tolerance. This page was last edited on 29 January 2019, at 08:51.